Here is some help for you when researching a purchase for anarcade basketball game for your home use. First, we will look at manufacturers of these types of games. Lifetime Products, Spalding, and Escalade Sports are the largest manufacturers of these types of systems - there are many other smaller makers as well. Of these 3 main players in this market, Spalding and Escalade Sports offer a more than 1 system. Each of these manufacturers offer very similar products in quality and play. However, certain minor differences between their product offerings may sway you one way or the other. We will look at each unique portion of their systems next. Lifetime Products makes only 1 system, model 90056. This system is a double shot game - meaning 1 or two players can play at the same time. This system has a couple of unique parts to it. First, the 90056 Double Shot uses infrared sensors to track scores. Traditional designs use plastic clickers to track scores. No one system is 100 percent accurate; but, infrared sensors tend to be more accurate tracking scores than plastic clickers. Plastic clickers will regularly get stuck in the down position when the ball goes through the net causing the unit to double or even triple count a score. Infrared sensors do not have that problem, essentially eliminating double and triple counting scores. Next difference for the 90056 is the frame of the unit. The poles used in the game frame are thicker diameter and heavier than other comparable poles from other manufacturers. The larger poles make the game more stable and more durable. Next difference, the frame at the base where the players shoot the balls is wider than other double shot game, sometimes by as much as a foot. This added space provides players more space to shoot and less bumping into one other. Lastly, the 90056 is one of the only Double Shot games to come with 7 basketballs. Other Double Shot arcade basketball games come with 5 or 6. This lower quantity of balls regularly interferes with game play when two players are playing as players fight one another to get the basketballs as they roll down the net. 7 basketballs tends to provide smoother game play, and less fighting between players. Spalding currently offers two indoor arcade basketball games, a single shot and a double shot. This immediately differentiates them from Lifetime Products as sometimes you should do not want, or do not have enough space, for adouble pop a shot shot game. The single shot game provides the same game play as the double shot game, only with a smaller frame and one basketball hoop to shoot at. Their basketball games use traditional plastic clickers. Their Double Shot game tends to be less expensive than Lifetime Products. Arcade basketball games are a lot of fun and will keep you and your family entertained for hours. Oh no... it's snowing already the kids can't go outside to play sports. So now what do they do? read a book? clean their room? Not these days, now days they just pop right on that smart phone for the rest of the day. Indoor basketball games are great to help your kids get their eyes off their electronics and develop fine motor skills. 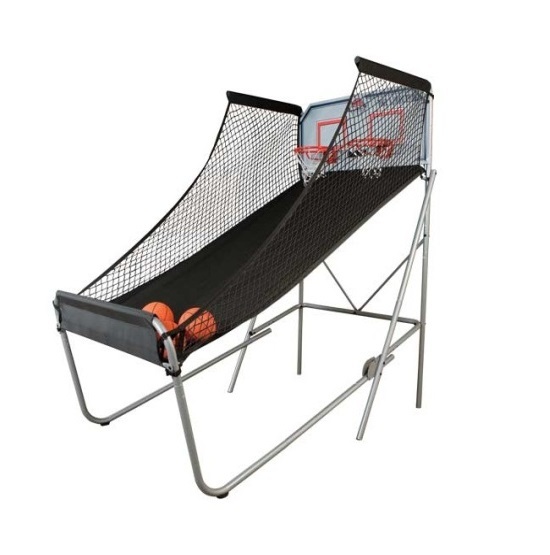 Get a nice reliable double shot and your kids will be able to shoot hoops and have fun no matter what the weather. 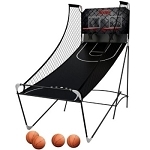 Arcade basketball Games are a great choice for a birthday or christmas present. 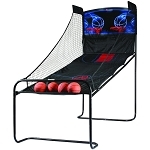 I have not used the Spalding or Escalade Sports arcade games, but I have used the Lifetime double shot. It is a great product, and definitely worth the money. The sensors are AMAZING! I can't believe how well they pick up your shots. Of the thousands of shots I've taken on that Double-Shot, the sensors have hardly missed any baskets. Double-Shots are so much fun to use, whether by yourself or with your friends. When I'm alone, I play double-shot and try to beat my own personal best. When I'm with my friends I battle them to see who the victor will be, and who the best basketball player is. Either way, it's great fun, and things get intense as you try to beat the buzzer. I know that the Lifetime double-shot does not take up too much space, which is nice, because you can compact the hoop down, giving yourself more space if it is getting in the way. I love the Double-Shot because it lasts a long time. We've had it for about 3 years now, (purchased it used), and the hoop still looks almost brand new. The Lifetime Double-Shot was and is great, and if the other Arcade Basketball Options are even half as good as the Lifetime Double-Shot, then they'll be AMAZING!